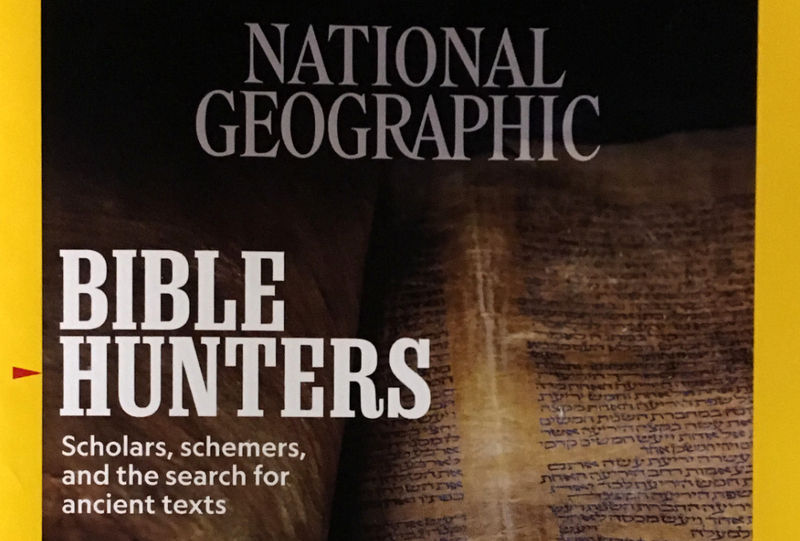 As Larry Hurtado mentioned on his blog a couple days ago, the cover story of the December 2018 issue of National Geographic magazine is on “Bible Hunters,” that is to say both nineteenth century figures like Constantine von Tischendorf and contemporary figures like Hobby Lobby’s president Steve Green. There’s actually a lot going on in both the scope and execution of this article. It is bookended with accounts of an ongoing American/Israeli led dig in caves near Qumran in the occupied West Bank, which is, as the article’s author notes, widely considered “illegal under international law.” It also contains a discussion of the manuscript formerly known as “first-century Mark.” For now, I’ll just lay out some initial observations. Dead Sea Scrolls: On a couple occasions, the article mentions that the American-Israeli dig has found small bits of ancient blank parchment, which suggests these caves in the Judean desert may well be a source for ancient writing surfaces used by people forging Dead Sea Scrolls, like those recently removed from display at the Museum of the Bible. The Museum of the Bible: In the article, Steve Green and co. come off as dupes in regard to the thousands of illegally imported cuneiform tablets they were forced to forfeit in a settlement with the US government in 2017. No mention is made of the fact that Green and his purchasing team seem to have been quite well aware of the laws they were violating. The manuscript formerly known as “first-century Mark”: The section on P.Oxy. 83.5345 is interesting. The author of the article made a visit to the Sackler Library at Oxford in January 2018 and was shown the fragment of Mark. Daniela Colomo is quoted as saying “The date is probably late second century, early third century. We never intended to take an official position, but there were all those blogs being written, and all the rumors. So because of all the anonymous publicity, we have to publish it soon.” I’m not sure what is meant by “official position,” and I’ve wondered elsewhere about the opaque connection between the Museum of the Bible and the Oxford scholars working on the Oxyrhynchus Papyri. As Larry also mentioned, there are a couple very dense fold-out graphics that cover such topics as constructing canons, physical characteristics of manuscripts, and new technologies for imaging difficult specimens. This entry was posted in Antiquities Dealers and Collectors, Fakes and Forgeries, First Century Mark, Oxyrhynchus Papyri, Van Kampen Collection. Bookmark the permalink.